It’s FREE and easy to set up and maintain. Using a blog platform is very easy and it’s simple to choose from a range of free design templates. When you want to change the template you can do this for all your posts at the click of a mouse. For the more advanced bloggers some platforms also support free plugins or extras. These extend and expand the functionality of your blog. Examples include audio players, Facebook like buttons, Retweet buttons and language translators. WordPress.org which is one of the most popular platforms supports a wide range of plugins (see link at the end of this post). You can establish a network of bloggers on your subject of interest. By allowing other people to submit posts to your blog you can benefit from crowd sourcing and attract more content from other bloggers. Become a leader rather than a follower. You are generating unique and hopefully interesting content. You will join a relatively small, but growing group of people who generate new content via social media. There are many feedback mechanisms. To help you understand how your content is being received there are many feedback mechanisms including comments, ask me a question, and track backs (links from other sites to your blog). It enhances your public profile and improves your online credibility. 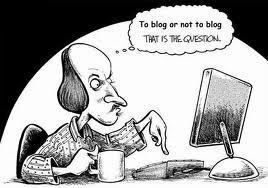 Blogging allows you to show the world what you know about a topic or interest. I am passionate about behavioural economics and conversion rate optimisation and so I write about those subjects. You can also demonstrate how you can structure a persuasive and engaging story or informative article. You can then post your blogs on Twitter, LinkedIn, Facebook and other social networking sites you use. It improves the reach of your social media posts. When I RT someone’s link I often only get 4 or 5 clicks, and a single RT if I am lucky. When I tweet a new post from my own blog I normally get over 500 clicks the first time I tweet it. I can also rely on a few RTs depending upon how popular it is. It keeps you focused during major life events. Personally I found blogging helpful when I recently left a job. It helped me focus my energy into a positive activity. You don’t have to blog about the life event, I didn’t. I decided to use it as a way of expressing my views on subjects that I felt strongly about and thought some of my Twitter followers might find of interest. It has worked best where I did some research, read a book or an article, and then put my personal thoughts down in my blog. Finally, it’s fun. I enjoy being able to express my views in a blog. It’s great therapy! Don’t do it if you don’t enjoy it as otherwise it becomes a chore. Thanks to Lisa Radin (@milguy23) for giving me the idea to write this blog and thank you for reading it. WordPress here is a useful article on WordPress impressive blog plugins.